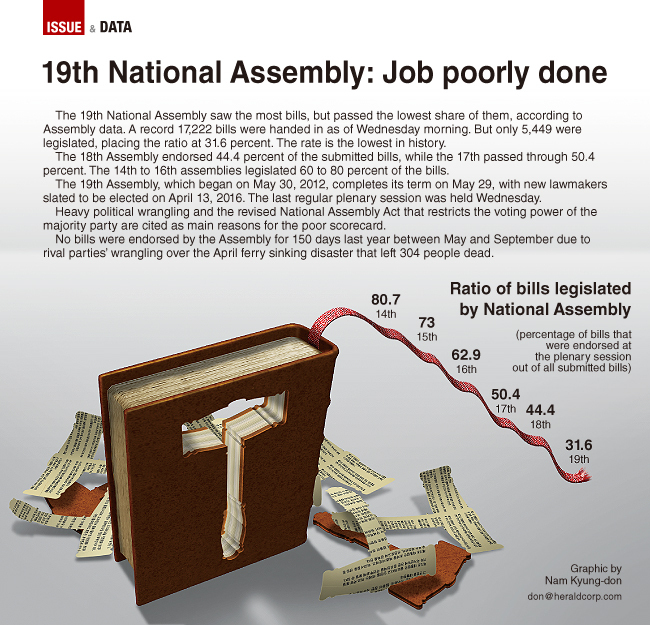 The 19th National Assembly saw the most bills, but passed the lowest share of them, according to Assembly data. A record 17,222 bills were handed in as of Wednesday morning. But only 5,449 were legislated, placing the ratio at 31.6 percent. The rate is the lowest in history. The 18th Assembly endorsed 44.4 percent of the submitted bills, while the 17th passed through 50.4 percent. The 14th to 16th assemblies legislated 60 to 80 percent of the bills. The 19th Assembly, which began on May 30, 2012, completes its term on May 29, with new lawmakers slated to be elected on April 13, 2016. The last regular plenary session was held Wednesday. Heavy political wrangling and the revised National Assembly Act that restricts the voting power of the majority party are cited as main reasons for the poor scorecard. No bills were endorsed by the Assembly for 150 days last year between May and September due to rival parties’ wrangling over the April ferry sinking disaster that left 304 people dead.